In this file photo, Auburn's Samantha Cerio smiles and signals to the crowd before competing during the NCAA women's gymnastics championships Friday, April 14, 2017, in St. Louis. The Auburn University senior thanked everyone for the support and prayers she received after injuring her legs during her routine. 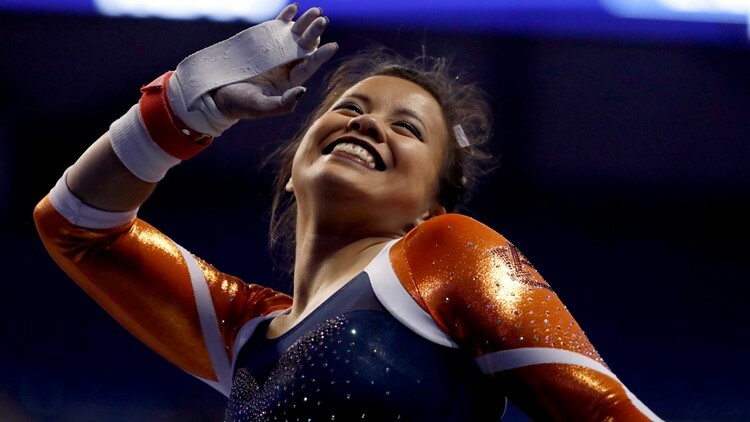 Auburn University senior Samantha Cerio had her nearly two-decade gymnastics career abruptly end Friday when she suffered what some have called "the worst sports-related injury" they've ever seen. Cerio was competing in the NCAA Regional Semifinal in Baton Rouge, Louisiana, when she reportedly dislocated both of her knees while doing a blind landing during her floor exercise, according to a tweet by Auburn gymnastics coach Jeff Graba. The entire gymnastics meet came to a halt as trainers and medical staff helped Cerio for several minutes before she was eventually taken off the floor on a stretcher. Auburn's women's gymnastics coach, Jeff Graba, told the Times-Picayune he had never seen anything like what had happened. He described her as the "heart and soul of the team." Graphic video posted online shows Cerio's injury, but many are urging everyone to avoid watching. "As someone who saw the injury live, don't go back and watch it. It's horrifying," reporter Amie Just tweeted. On Sunday, Cerio posted a lengthy Instagram post and said that Friday night was her last as a gymnast. "After 18 years I am hanging up my grips and leaving the chalk behind," Cerio explained. She later tweeted out a thank you to everyone who has sent her encouraging messages and said she's "doing well right now and getting lots of rest! The Huntersville, North Carolina, native was recently named the SEC co-Scholar Athlete of the year for gymnastics and is majoring in aerospace engineering. After graduation, Cerio has a job lined up in Seattle with Boeing as a Structural Design Analysis Engineer. She recently told AuburnTigers.com that she wanted to change the stereotype of how student-athletes are viewed at Auburn and across the country. Editor's note: This story has been corrected to reflect that Samantha Cerio dislocated both her knees, not broke both her legs.